For routing high pressure water from the pump to the cutting head, most waterjet cutting systems use rigid stainless steel tubing. This consists of a lot of pipe sections and connectors and normally is not flexible – it can be if a semirigid steel material is used, but such a construction needs a lot of space. As an alternative, KMT Waterjet Systems offers steel-reinforced high pressure hoses which – compared to steel piping – allow for a higher degree of flexibility when setting up high pressure lines. 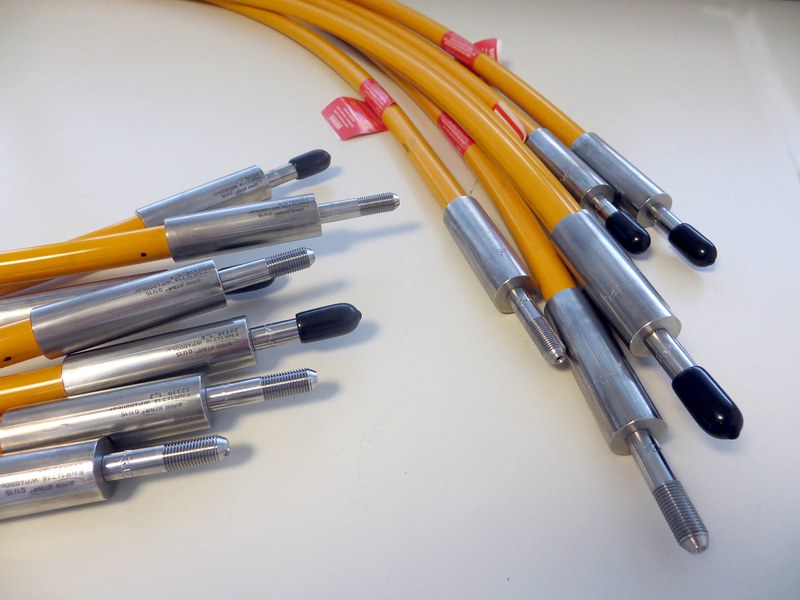 Oftentimes, the use of flexible high pressure hoses, which can be installed up to a maximum pressure of 4,000 bar, facilitates the high pressure water supply for waterjet cutting systems: The installation is less complex compared to a rigid tubing and leaves a certain degree of flexibility of the hoses even when they are set under pressure. A cutting head can be installed flexibly in the rather inaccessible interior of a continuously working production line. In such a case, there may not be the space for a semirigid “whip” made of stainless steel. If the piping system is constantly vibrating due to the machine design or the application, the flexible hoses can act as a vibration damper thus making the complete system more stable. The prototype of a cutting system can be supplied with high pressure water easily without the need of laboriously installing the final high pressure tubing. That is especially useful for robot applications, as the motion sequences of the robot arms can be tested using the easy-to-install flexible hoses. Due to their features and characteristics, high pressure hoses are particularly suitable for applications at comparable low pressure ranges. Often, these are pure water cutting applications for the processing of insulation material, soft construction material, foam material or paper. KMT offers high pressure hoses made of a specially bonded multilayer stainless steel mesh which includes ferrule terminals of 316 stainless steel (V4A). The interior of the hoses is lined with a resistant core of polyoxymethylene, and the wear-resistant polyamide cladding is easily cleanable. 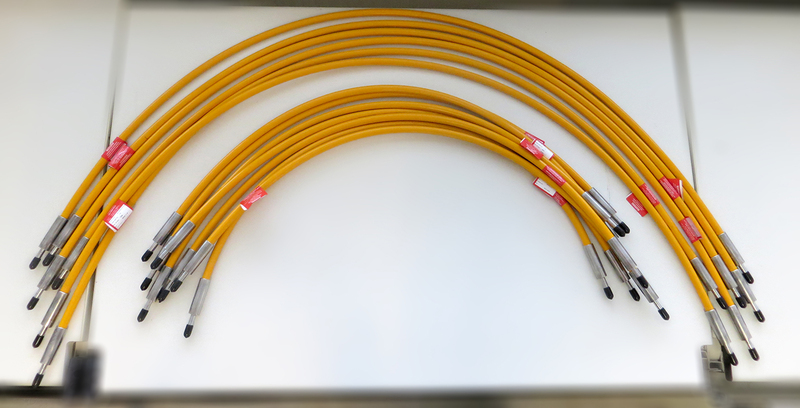 The hoses come in standard lengths of two to five meters, however, special lengths are possible on request. It is often amazing how efficient and reliable the components of KMT high pressure systems prove to be: Despite of the enormous pressure they are exposed to, KMT parts regularly achieve lifetimes of several hundred operating hours – for a car that would mean a mileage of several 10,000 km. A pump running 2000 hours a year can be compared to a taxi which reliably carries its passengers between 150,000 and 200,000 km a year. To ensure this performance, regular maintenance is of course necessary – after all, a car should also be serviced on a regular basis. And a high pressure pump is for a waterjet cutting machine what a motor is for a car – without it, the complete system won‘t work. However, compared to a car, the main components of KMT high pressure pumps are quite accessible and easy to maintain. If machine operators plan on conducting the maintenance themselves, KMT offers special tools and training programs. If the regular maintenance is to laborious or complex for the operators, they can draw on one of the comprehensive KMT service packages. Of course, it is not as easy for the machine owner to take his equipment to a garage as it would be with a car. However, in such a case, the garage comes to the owner – in the form of a KMT service technician. KMT offers a suitable service package for every user: From a basic annual service for small workshops with low cutting demands to a regular maintenance program including preventive exchange of wear parts for big industrial applications. With their customers, KMT develops maintenance contracts assuring the reliable operation of the cutting system – regardless if the system in question covers the operation of a single 15 PS pump or a network of several 125 PS PRO pumps cutting at 6,200 bar. Additionally, machine operators can benefit from the experience and technical knowledge of the KMT technicians: They always have a hint at the ready or suggest activities that help to ensure the long-term reliability of the machine. And of course, the KMT technicians know about many different waterjet applications therefore being able to provide their customers with the most current advice concerning the waterjet cutting technology. Thus, the regular service intervals help the machine operators to optimize the performance and productivity of their machine.